Before air conditioning, airplanes, and plastics were invented, and before science was changed forever by Albert Einstein's special theory of relativity, the National Institute of Standards and Technology (NIST) began laying the technical foundation for the world's most prosperous nation. The cornerstone was laid at the original NIST site in Washington, D.C., in 1903. Chartered by the U.S. Congress on March 3, 1901, it was the first physical science research laboratory of the federal government, established at about the same time as the nation's first commercial laboratory. Teddy Roosevelt had just become President; a middle-class annual income was no more than $5,000. It was the dawn of the age of technology. At that time, the United States had few, if any, authoritative national standards for any quantities or products. What it had was a patchwork of locally and regionally applied standards, often arbitrary, that were a source of confusion in commerce. It was difficult for Americans to conduct fair transactions or get parts to fit together properly. Construction materials were of uneven quality, and household products were unreliable. Few Americans worked as scientists, because most scientific work was based overseas. Yet the United States was becoming a world power, with an industrial economy driven by the steam engine, the railroad, and the expanding reach of electricity. Other industrialized nations already had established standards laboratories. The need for such an organization in the United States was discussed for many years by scientists and engineers. One complained, for example, that he had to contend with eight different "authoritative" values for the U.S. gallon. The growing electrical industry needed measuring instruments and was often involved in litigation because of the lack of standards. American instruments had to be sent abroad for calibration. The nation already had an office of weights and measures. The first efforts to provide accurate (albeit non-legal) standards of weights and measures were made in the 1830s by Ferdinand Rudolph Hassler, a Swiss engineer and metrologist who immigrated to the United States and became the first superintendent of weights and measures. But the office had few employees, and some people disliked the idea of the federal government imposing standards or anything else on industry. NIST's founding was described in the March 11, 1901, edition of The Evening Star. After strong advocacy by leading scientists and industrialists who endorsed the concept of a national standards laboratory, principally to meet the needs of electrical instrument makers and manufacturers, the U.S. Congress agreed to go along with the idea. NIST originally was part of the Treasury Department, then moved to the Department of Commerce and Labor, later split into two units. The Institute went with the Department of Commerce, where it remains today. 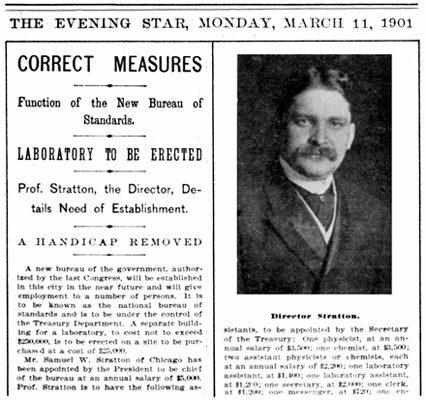 Samuel W. Stratton, a professor of physics at the University of Chicago, became the first director, a post he held for 21 years. The original staff numbered 12. After several years in temporary quarters, NIST moved to a site on Connecticut Avenue in the District of Columbia, a few miles from the White House. The scientific and technological programs were started from scratch. After improving the standards of electrical measurement, NIST quickly developed better standards of length and mass and new standards of temperature, light, and time. The Institute also established standards of safety in commerce and industry and of performance among public utilities, and it prepared and maintained hundreds of standard samples of materials that helped introduce quality control to U.S. industry. To advance fundamental science, NIST developed increasingly precise instruments, measurement techniques offering greater range than ever before, and wholly new standards such as those for sound, frequency, and radiation. The need for standards was dramatized in 1904, when more than 1,500 buildings burned down in Baltimore, Md., because of a lack of standard fire-hose couplings. When firefighters from Washington and as far away as New York arrived to help douse the fire, few of their hoses fit the hydrants. NIST had collected more than 600 sizes and variations in fire-hose couplings in a previous investigation and, after the Baltimore fire, participated in the selection of a national standard.